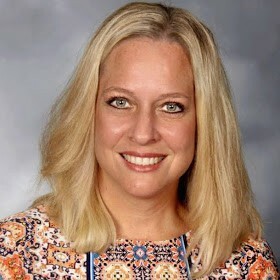 I am incredibly proud and honored to be the principal of Martell Elementary School in Troy, Michigan. The Martell staff was very happy to welcome your children back this week! We hope you had a wonderful spring break. 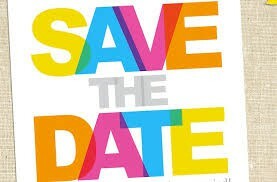 We are looking forward to all the fun events and great learning we have until June 13th! I have updated the calendar below with many dates. 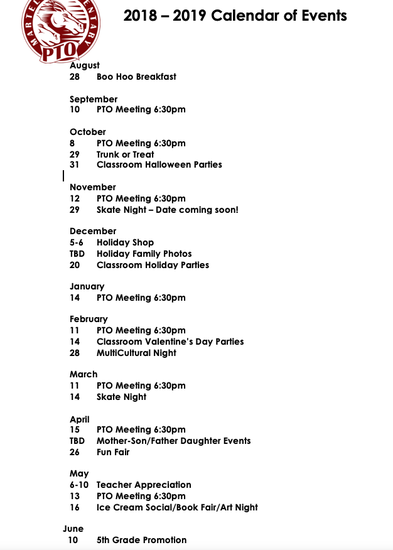 I will continue to add to it as we finalize our end of the year events! Please refer to it often, many things are coming upon us! Our Fun Fair team is working hard on classroom basket collections. When you are out shopping this weekend, please consider picking up something for your child's classroom basket. 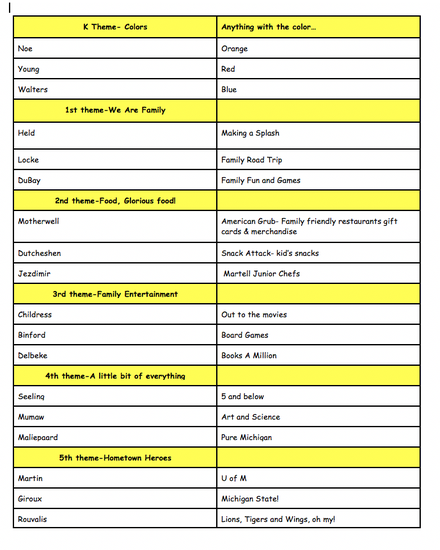 If you need a reminder, the list of baskets is below!! ~Pennies for Pasta ends this Thursday, April 18!! 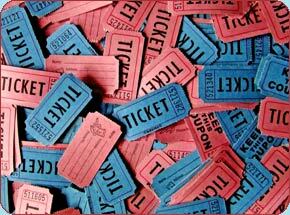 ~Classroom Fun Fair basket donations are in full collection! ~Please remember there is No School on Friday, April 19. 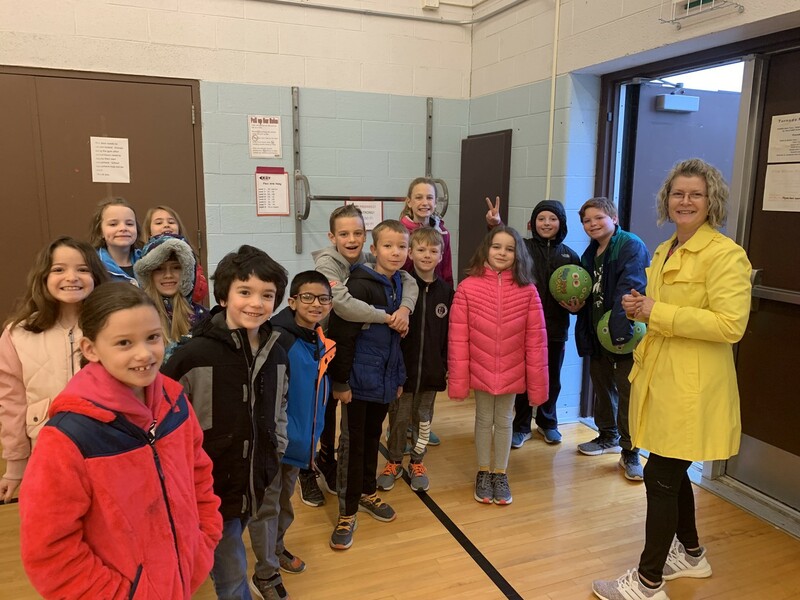 Wednesday, April 17 - 8:00AM Mustangs in Motion, Parent/Child on walking track! 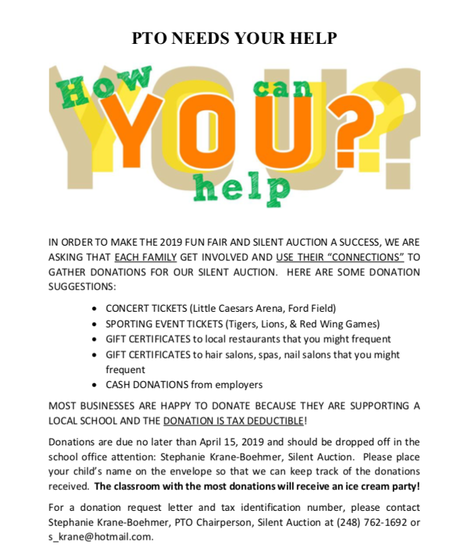 Wednesday, April 17 - Classroom Fun Fair basket donations due! Wednesday, April 24 - 8:00AM Mustangs in Motion, Parent/Child on walking track! Wednesday, May 1 - 8:00AM Mustangs in Motion, Parent/Child on walking track! 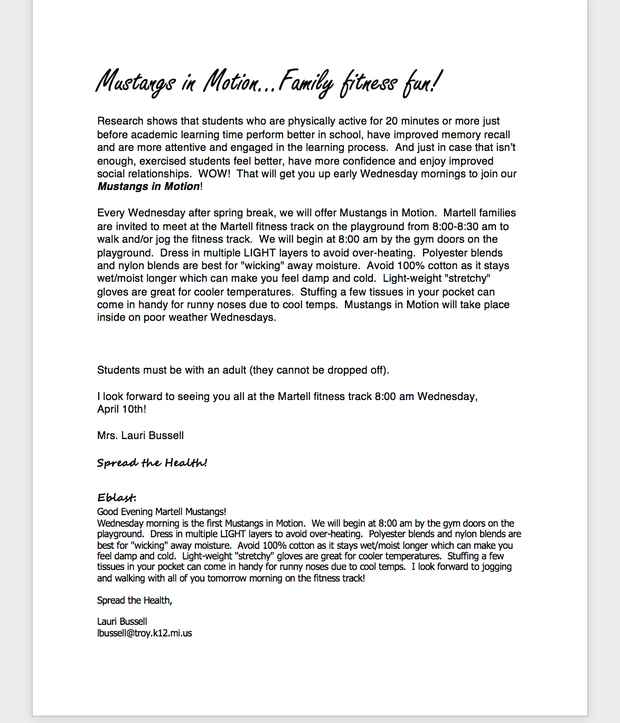 Wednesday, May 8 - 8:00AM Mustangs in Motion, Parent/Child on walking track! Wednesday, May 15 - 8:00AM Mustangs in Motion, Parent/Child on walking track! Thursday, May 16 - Gr. 3-5 PARENT Literacy Night with Teacher's College at Troy Union Elem. 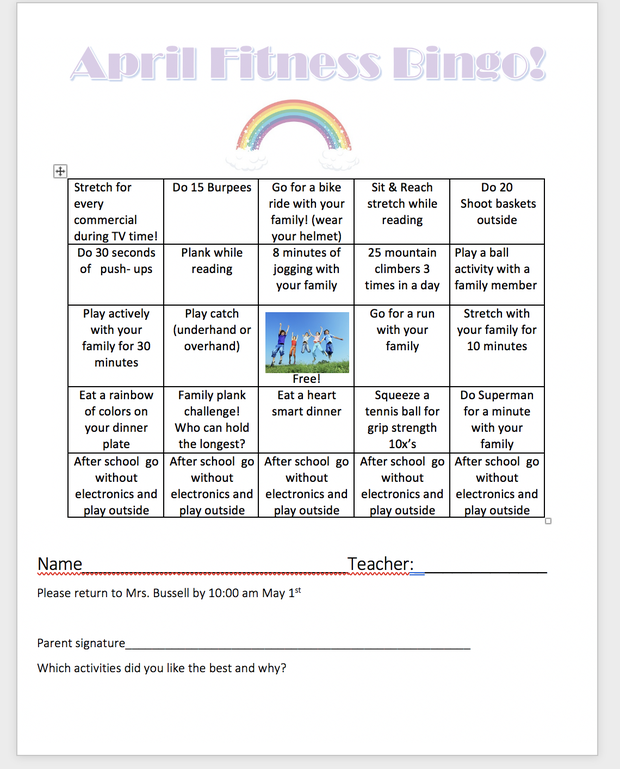 Wednesday, May 22 - 8:00AM Mustangs in Motion, Parent/Child on walking track! 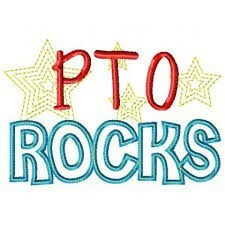 Wednesday, May 29 - 8:00AM Mustangs in Motion, Parent/Child on walking track! 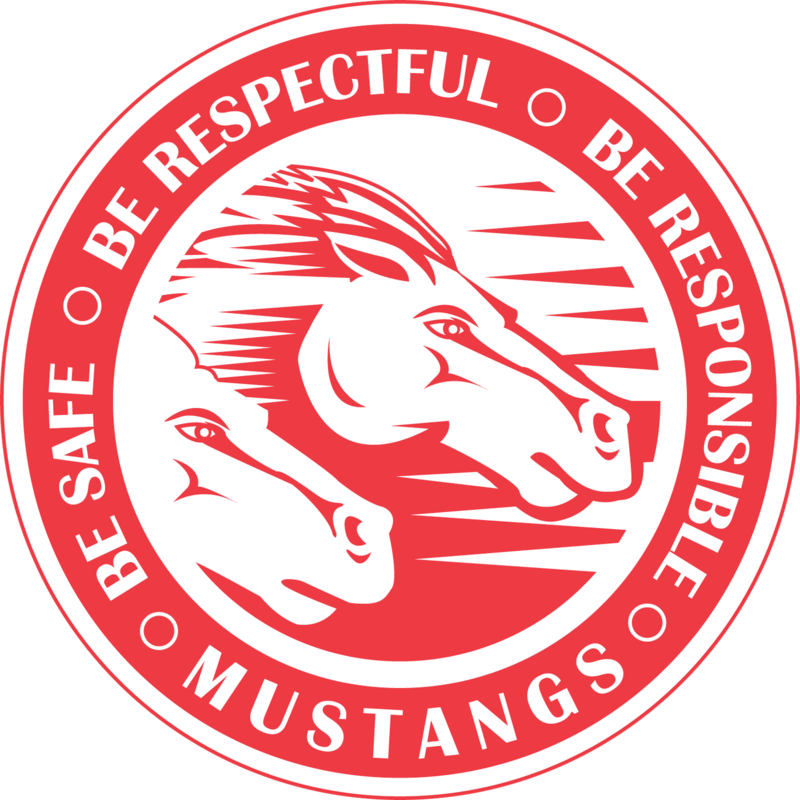 Wednesday, June 5 - 8:00AM Mustangs in Motion, Parent/Child on walking track! Wednesday, June 12 - 8:00AM Mustangs in Motion, Parent/Child on walking track! Barsh's Bagels - Every Wednesday is pre-sale $1.00 - Every Friday is classroom delivery! Calendar subject to change as we add more awesome events to Martell! When we return from Spring Break, the 2019 M-STEP Assessment (Michigan Student Test of Education Progress) will be administered in the months of April and May. This is a state mandated assessment that all 3rd, 4th, and 5th graders in the state of Michigan will participate in. A calendar has been published by the State of Michigan’s Department of Education that gives a testing window when each test must be administered. 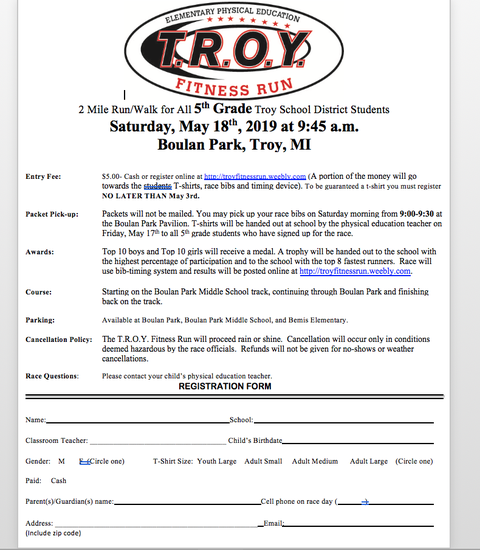 All students in the Troy School District will be taking the M-STEP online using his or her own iPad. The district provides each elementary building with plug in keyboards to work with the iPads for instructional purposes. The students have been using the keyboards in the classroom during instruction and they will use the keyboards for the M-STEP assessment as well. There are a few things that you can do to assist us in making sure your child is ready daily to take this test. Make sure your child’s iPad is charged up every night to 100% power. Make sure your child has his/her iPad at school every day. Your child will need headphones to listen to directions on the assessment. Headphones are preferred over ear buds if possible. Eat breakfast before coming to school. Get a good night of sleep. Monitoring bedtimes is appreciated. We do know that attendance at school is extremely important at all times; and, when a child is absent, we have some flexibility to help him or her catch up. This fact is not true for M-STEP as the State of Michigan decides the testing window. We are asking that you please adhere to the below schedule and refrain from scheduling voluntary absences for your child during your child’s assessment period. If a child is absent on specific days, we will do all that we can to administer the test on the make-up day, but your child will miss important class time in order to make-up the M-STEP assessment(s) that were missed. Thank you very much for helping our Mustangs be ready for this test! 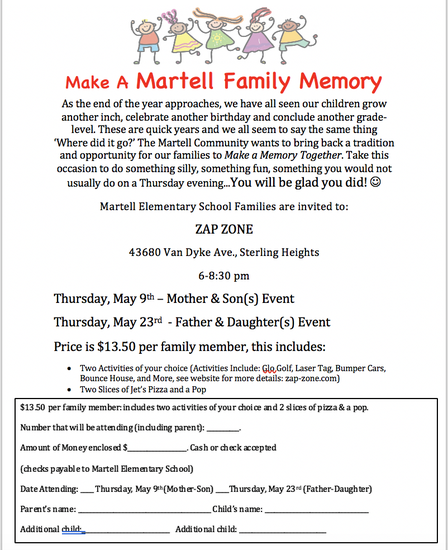 Come on out with your child and walk the Martell track before school! Our 5th grades are full into the MStep. Thanks to our fabulous teachers and families for helping our students be prepared! 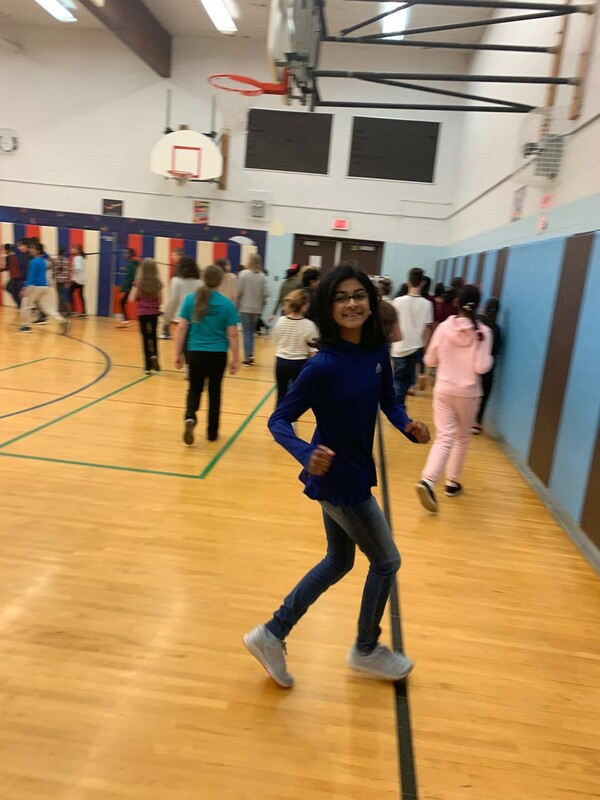 Students have a chance to run off some energy before they sit for the test! Monday, April 15 is the next meeting at 6:30PM - Please come join us! Buy Martell Spirit Wear all year long! Martell earns a BLUE RIBBON nomination! 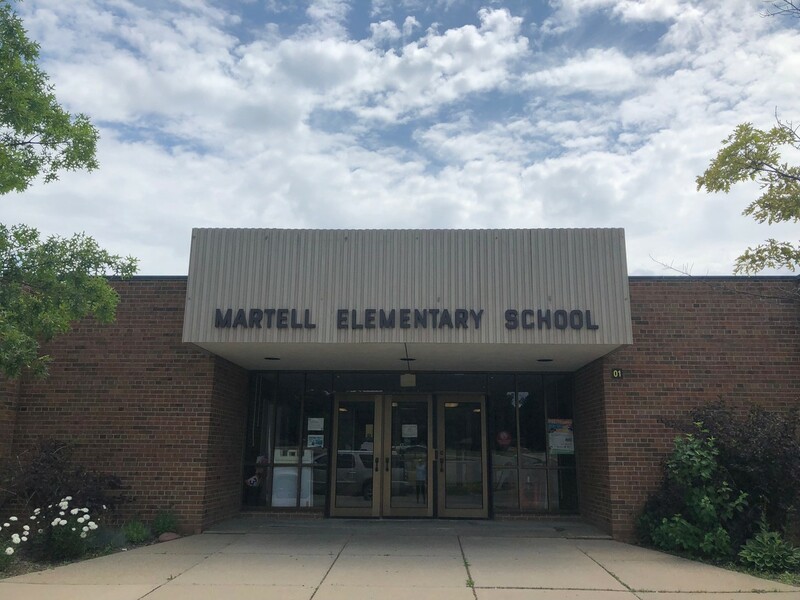 Martell Elementary School has been nominated by Michigan to join the esteemed community of National Blue Ribbon Schools. National Blue Ribbon Schools are public and non-public elementary, middle, and high schools that are producing outstanding results for all students. They have demonstrated consistent excellence, and made progress in closing gaps in student achievement. Martell has been nominated as an Exemplary High Performing School. Only 13 schools in the state are nominated each year. This is QUITE an honor! Once our paperwork is submitted, we will hear in the fall is we are officially awarded with this honor! I will continue to keep you updated! 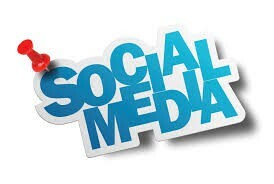 Please join the Martell Elementary PTO page on Facebook! 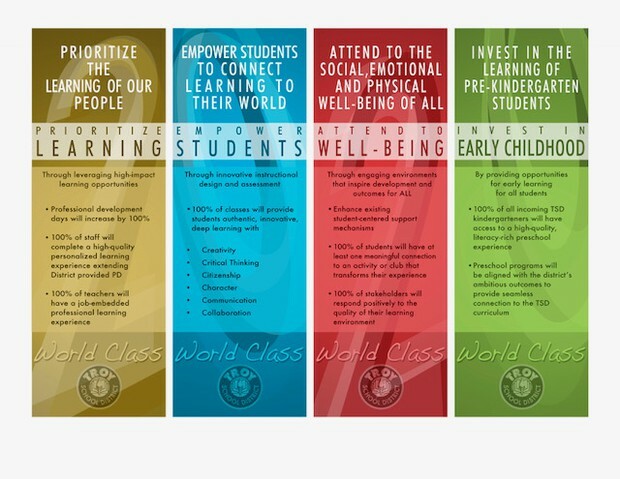 Troy School District is committed to living out our vision of a World Class education. The 4 key characteristics below are the foundation for what we live in Troy and at Martell.